Halloween’s coming up — and let’s face it. I’ll eat some candy. You’ll probably eat some candy. And the kids are going to eat a lot of it. Weeks after Halloween, you might be still be feeling the aftershocks of an epic night of trick-or-treating: leftover candy stashed under your kids’ beds, in your own treat drawer, in the break room at work, in the candy jar at the bank or dry cleaners. It’s an important question, and one I bet we all struggle with each year as Halloween’s influx of sugary treats leads into the holidays and a steady stream of cookies, fudge, candy canes, chocolate and other goodies. Halloween is kind of like sugar’s opening act. How do we enjoy the fun and festivities of Halloween, but keep the candy in check — not only for our kiddos but for ourselves as well? Here are a few of Halloween “tricks” that can help with the goal of fostering good health — the ultimate treat — throughout the season. This is pretty obvious, but I know I’ve been certainly guilty of standing in the candy aisle planning to buy Sour Patch Kids — which I don’t like — and then buying mini-Snickers, which I’ll hoover up well before Halloween arrives. Part of keeping a healthy household is to make sure you minimize the temptations. This means keeping binge-bait out of your pantry every day, but especially during Halloween and other candy-focused holidays. I’m not usually a big fan of procrastination, except when it comes to Halloween. This is a case where it pays to procrastinate and buy late. One, candy is often cheaper the closer we get to Halloween. Second, if the candy isn’t sitting around in your kitchen for weeks before Halloween, you won’t be able to eat it. Don’t kid yourself that when you buy your candy weeks early you’re being organized — you’re supporting a habit. I’m not saying you should be the creep who gives out apples — which might land you on some neighborhood watch list or guarantee a late-night t.p. session by disgruntled teenagers. But there are some healthier trick-or-treat alternatives out there. If you get a lot of little kiddos, they’ll be just as thrilled with stickers, temporary tattoos or a small toy — or even some Dracula teeth (just think about how excited kids are to pick out of the prize drawer at the doctor’s or dentist’s office). You could also give away mini-fruit leather sticks or even mini-Larabars. I realize mini-fruit leather sticks and mini-Larabars can get a bit expensive, so if you get a lot of trick-or-treaters and need to stock a large quantity, simply go with dark chocolate. 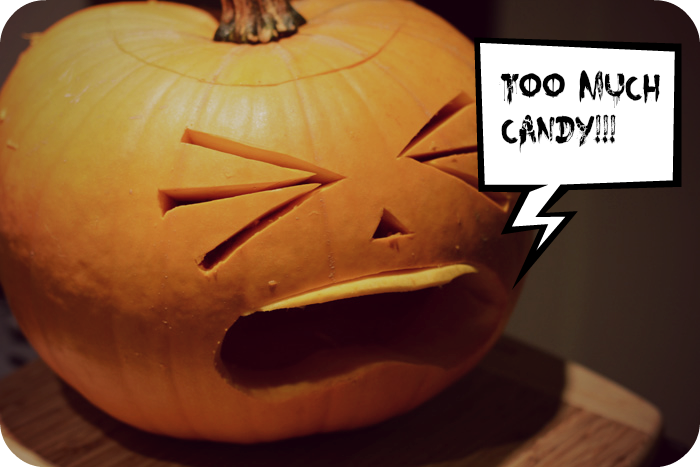 You’re still giving away candy, after all, but at least it will be a tiny bit healthier. Dark chocolate typically contains far less sugar than milk chocolate varieties. Before Halloween, talk to your kids — and yourself — about what your limits will be. Defining these parameters up front can help keep you from completely going off the rails when Halloween hits. For example, set the rules for Halloween night: how many pieces of candy can the kids eat that night, taking into consideration any treats from the pre-trick-or-treat Halloween parties. Decide for yourself how much candy you’ll indulge in, and stick to your limit. And remember to set — and enforce — a limit for post-Halloween. Such as one piece per day, after a healthy dinner. This is probably my favorite tip. Here’s how it works: at the end of Halloween night, after you review the loot and determine which candies the kids are allowed to eat, have your kids set aside the majority of the candy for the Sugar Witch. For example, we usually let our son keep a large enough stash to enjoy a piece of candy a day for about ten days. The rest gets put into a ziplock bag for the Sugar Witch. Have your kids set the candy bag out before bedtime, same as they would a tooth for the tooth fairy. After they fall asleep, replace the candy with a toy, preferably one they’ve been wanting for awhile. It doesn’t have to be expensive — just something they’ll be excited to get. If your kids are too old to believe in the Sugar Witch, you can still continue the tradition. Just set up a fun incentive or buy-back program. For example, have them “turn in” their candy for extra privileges (extra TV or iPad time, getting to stay up later on a weekend night, a special outing, etc.) or small gifts (iTunes gift card, etc.). Here’s the catch — do NOT just take the candy and hide it as your personal after-hours stash. Have a plan for removing the candy from your household. The very next day. Don’t stash the candy, intending to take it into the office later in the week, and then put it off. You’ll just end up diving into the stash at some point (I speak from experience). Get rid of it. Fast. See below! This step is probably the most important. Once extra candy enters your household, you need to get rid of it. Immediately. Contribute the extra candy to the office candy jar. Better yet, research local non-profit organizations and shelters to see if they accept Halloween candy donations. Or, participate in Operation Gratitude, which gathers donated candy into care packages and sends them to members of the US military. Check with your dentist — many help collect candy as part of Operation Gratitude’s program — or check out Operation Gratitude’s website for other ways to donate. One of the most powerful ways to make a positive change in your life is to focus less on taking away, and more on adding in. After time, the more positive habits — an additional serving of vegetables a day, getting 15 or 30 minutes more sleep a night, doing a few minutes of daily yoga if that’s all you have time for — will add up and start crowding out the unhealthy habits and choices. The “adding in” approach can be especially helpful when you know your regular routine will encounter some disruption or extra temptation. During the Halloween (candy) season, be sure to take extra good care of yourself to make up for the almost inevitable indulging. For example, order a side salad with lunch. Or, if you already do that most days, go with an entree salad instead. Get a little extra sleep. Roast some veggies at dinnertime. 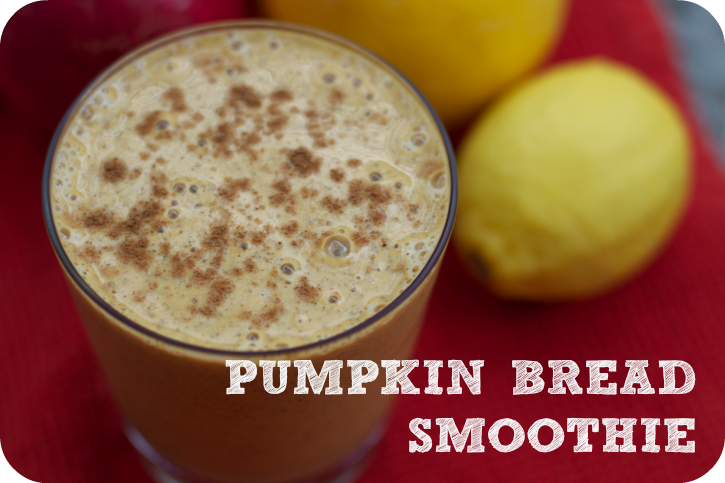 For breakfast, you could even try my Pumpkin Bread Smoothie instead of your usual latte-and-scone. It’s naturally sweet, super tasty, and even better than coffee shop pumpkin bread. It also happens to very healthy — the pumpkin and turmeric are both anti-inflammatory and very healing for the body. Place ingredients into high speed blender, adding ice last. Process until creamy and smooth. Serve immediately or store some in fridge for later. Salud! What’s your plan for Halloween? 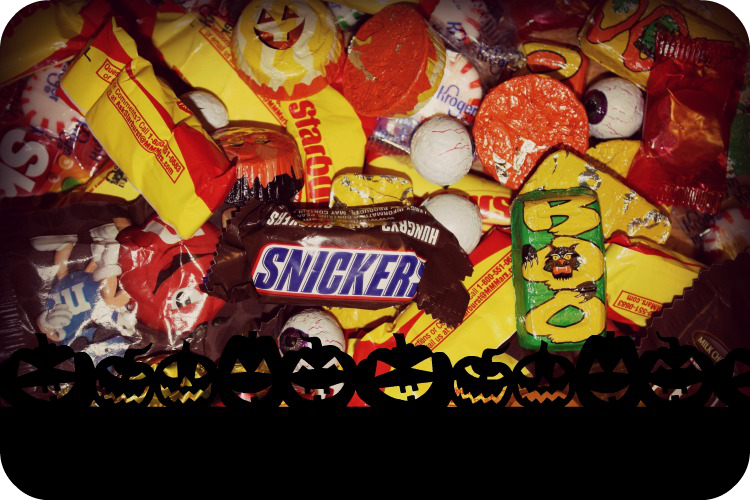 Do you have any Candy Management tips you’d like to share? If so, please post a comment — I’d love to hear from you! Yeah, I get it. I’m thinking we may go with dark chocolate M&Ms and throw some vampire teeth and stickers into the mix. Any suggestions? Haha, skeptical Daphne! I love that you have a work-in-progress about the candy fairy/sugar witch. Keep me posted! these are great tips (i share your low regard for sour patch kids, although tom does not), but i have to balance the concern for my family’s health with the need to not be the house on the block that becomes famous for having lame treats. you know, the opposite of the house that gives full-size candy bars. Monica- this is such a great post. Last year I started a children’s book called the candy fairy which was based on the sugar witch concept. This was a good reminder to get back to that story and make the high-fructose overload go away. I tried the candy fairy with Daphne but she didn’t buy it. I also didn’t think about saving some of the candy. I will try again this year! Thank you for sharing this! Fantastic ideas! Thank you, Monica! Cute! We did the “switch witch” this year, which is similar to the Sugar Witch. Next year I want to set up a candy drive and have all the parents we work with collect this candy and send it to the troops. Not that they need all this candy…but I’m sure they would appreciate the thought and a little treat! Three cheers for the Switch Witch — and good luck on next year’s candy drive!